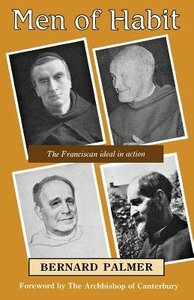 In Men of Habit, Bernard Palmer presents a series of mini-biographies of four oustanding Anglicans who achieved fame as examplars of the Franciscan ideal in action in the first half of the twentieth century. All four men founded, or helped to found, religious communities or organisations and were the guiding lights of those communities in their formative years.The four men of monastic habit are:Father Andrew (Ernest Henry Hardy, 1869-1946), co-founder of the Society of the Divine Compassion; Brother Douglas (Robert Douglas Downes, 1878-1957), co-founder of the community which grew into the Society of St Francis; Father George Potter (18871960), founder of the Brotherhood of the Holy Cross; Brother Edward (Edward Gordon Bulstrode, 1885-1953), co-founder of the movement known as the Village Evangelists.All four characters were outstandingly able men whose deep faith found practical expression in endless good works. Bernard Alvin Palmer (1914-1998) was the originator and author of over 165 books for Christian youth, as well as several books for adults. He created series such as the Danny Orlis series, Felicia Cartright series, and the Pioneer Girls series which he co-authored with his wife, Marjorie Palmer.